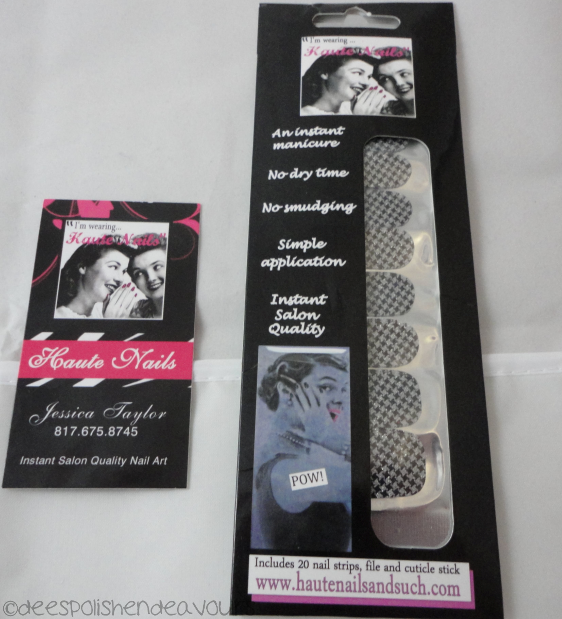 A couple of weeks ago, I was contacted by an awesome lady named Jessica Taylor, and she asked me if I would be interested in doing a review of her product - nail polish strips! I then went on to check out her website and ask her which design she really liked - I knew instantly which strips I wanted, but I went for her suggestion anyways.. She mentioned the Maggie which was a really great suggestion as they were the strips I was most eying up! 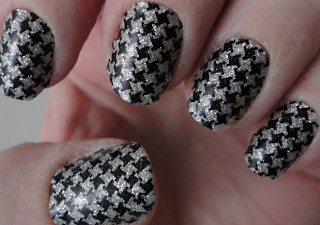 If there is one design I always fail miserably at replicating, it is houndstooth. Done! They arrived in the mail a few days ago - and I mean, come on, nail mail, of course I was excited!! 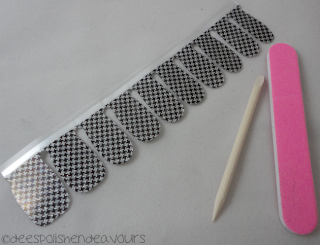 The kit includes 20 nail strips in varying sizes, an orange stick/wooden stick, and a nail file. All for $10 - kind of an amazing deal in my opinion!! Now, of course I was too excited to put these bad boys on that I wasn't really thinking.. I had dishes and that to do.. And you all know my stance on wearing gloves.. Big mistake!! My other mistake was not taking photos right after my application. I did some patch work on my thumb nails as I ripped some off, and I lost a chunk from my ring finger.. BUT.. I must say I am really surprised how well they held up.. And this is without top coat no less. I do apologize about my extremely dry hands in the photos. My hands hate me this winter. 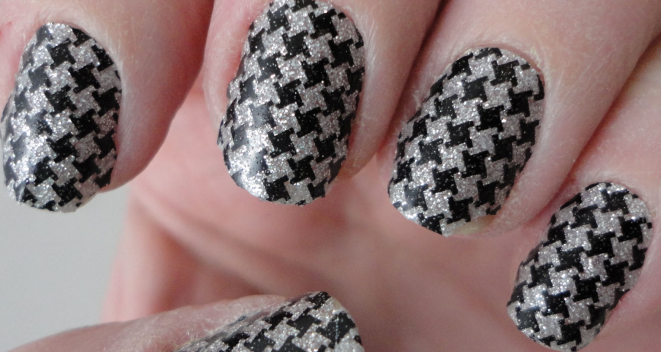 While my after work photos may not do these strips justice, I have to say - they are beautiful! I think polish strips are great things to have.. 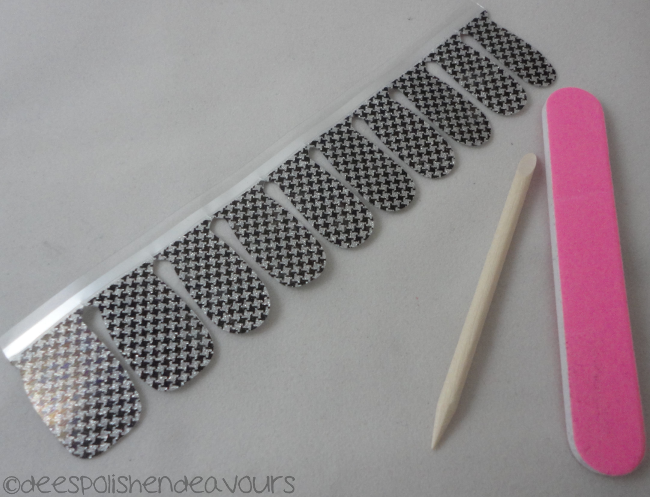 I often get asked when I go out if my nails are done using strips, of course I get the open-mouthed shocked look when I say they aren't, but, most of the ladies complementing my nails are wearing the strips - so they are a very popular trend.. I think Haute Nails has a great selection AND I like the fact that quite a few of them are glittery! Who doesn't love that?? And honestly, $10 a pop? Yeah, I will be ordering more! Jessica started her business at home, and is starting to branch out and has been selling to companies AND she is great to talk to. My suggestion? Go look at the strip selection and snag some for yourself!! This is a really cute pattern and I love the packaging!